This collection of more than 70 study strategies teaches children in grades three through six efficient and effective learning techniques. Experienced educators share their tips to better organize school work, understand and use different learning styles, improve reading ability, and prepare for oral presentations and tests. Line drawings, charts, and diagrams enliven and clarify each of the strategies. Accompanying activity sheets round out the learning process. 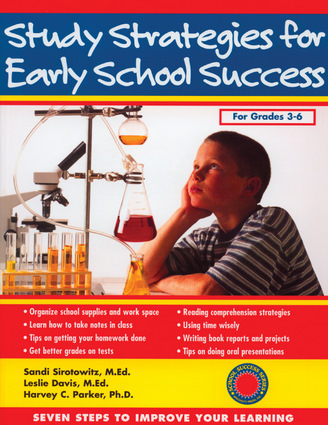 Sandi Sirotowitz, MEd, Leslie Davis, MEd, and Harvey C. Parker, PhD., are the authors of Study Strategies Made Easy. Sandi Sirotowitz and Leslie Davis founded Educational and Diagnostic Services, Inc., a comprehensive learning center in South Florida. Harvey Parker is a clinical psychologist and educational consultant known nationally for his work in child and adolescent behavior and development. They all live in Plantation, Florida.